We thought it only fitting, with Stanley Cup Playoffs beginning on Wednesday, April 16, to show a commission completed by Chuck Pyle. 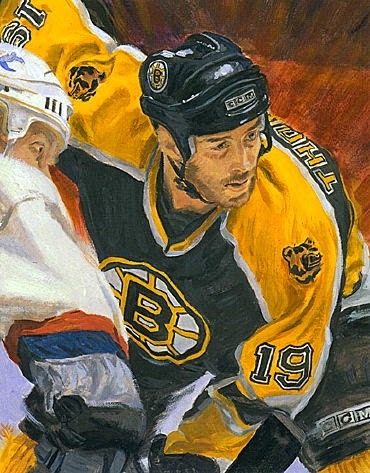 A San Diego based memorabilia company asked Chuck, along with a small group of other illustrators, to create original paintings of NHL hockey greats for player card sets. Each of the paintings were created at size and selected boxes had an original painting at random included, making a one of a kind collector's item! We would love to get our hands on one of those sets, especially this one with hockey great, Joe Thornton from the San Jose Sharks!